I couldn't resist lifting and reposting this wonderful picture, taken from my favorite blog EVER, Capadia Design by Diane Campbell Payne. If you are not a follower, you MUST join up. 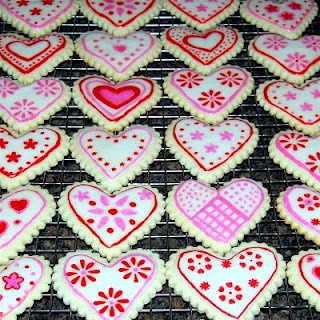 Can you believe how luscious these cookies are -- and Diane writes that she made them using a Cricut cartridge?! I am clueless as to which one, so I'll be watching for her answer! 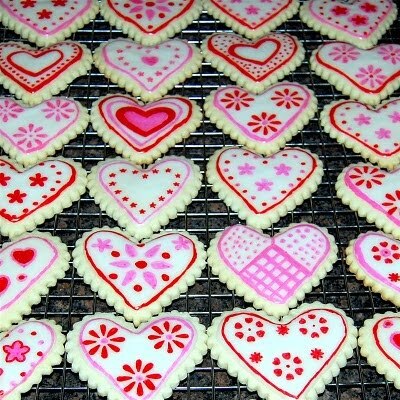 In the meantime, let these cookies remind you that this weekend will be our Valentine's Day Cards Blog Hop. Scroll down to older posts for more info, or click on the cute cupid picture in the top right of this blog. Looking forward to seeing you back then, starting on Saturday at 7 a.m.! And when you're not blog hopping, MAKE COOKIES!!! !